As anti-government protests in Venezuela carried on in the streets, Venezuelan President Maduro practiced his salsa dancing on TV. 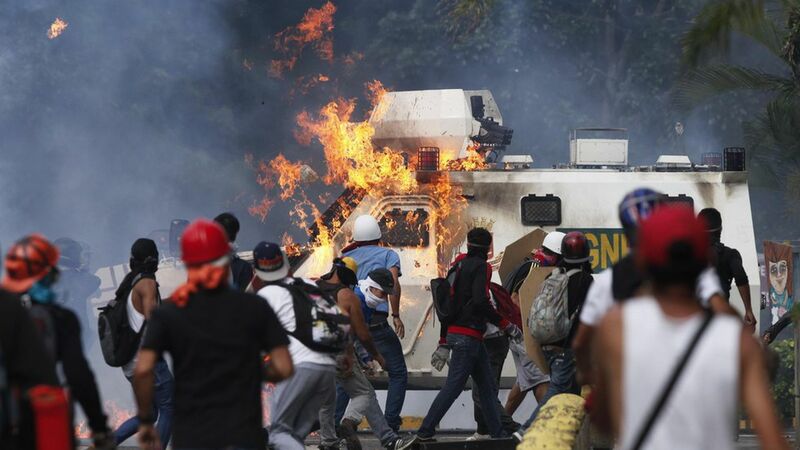 What's happening: Images of the violent protests (including one showing a man on fire) have circulated social media, drawing the world's attention to the country's unrest. There have been at least 12 deaths since April, the BBC reports, as the government and its opposition accuse each other of trying to form a coup. And they're unhappy about the country's recent food shortages. Sound smart: "Toma de Caracas" (the taking of Caracas, Venezuela) is what residents call the protests on the streets and in Twitter hashtags. President Maduro's (un)popularity: He's Hugo Chavez's successor, so he has strong support from the pro-government "Chavistas" who are fighting against the United Socialist Party. But many of the Chavistas are low-income residents who rely on the country's social programs that are funded by export revenue. However, about 95 percent of Venezuela's export revenue comes from its oil exports, which was used to help approximately 1 million Venezuelans, and oil prices have been falling steadily under Maduro, thus leading to funding cuts for their social programs.